Yay, I’m glad to have this one finished! I added two borders since I had lots of scraps just the right size, and now its a perfect lap size, I think it ended up being about 63″ by 75″. I wasn’t so sure about this one as I was making it, but now that its done I am in love with it. The back is a solid yellow cotton to match the front. And for those of you that want to know, the tutorial for these blocks can be found here. such a lovely quilt!! i really love how you did the border! Gorgeous! I love the colours ……not so sure about the 'action' shot though lol! Action shots… ha ha ha…. awesome. That's really lovely! I love the fabrics you have used. Great colour combos. Beautiful Colours, I love this quilt, I've been looking for a circle quilt to do…I think my search has ended!! Thanks heaps!! Love the quilt, great colours. Can you do action shots in focus? This quilt is very pretty. Espeically love the action shot…I am sure it is the beginning of a new trend for blog photos. As always, thank you for including a tutorial! Allison…it looks great! Love the aqua binding…did you machine stitch it? I'd like to try it for the quilt I'm working on but justed wanted to hear how others have done theirs! What size of binding strips did you use? That turned out so cute! and I'm going to do more with your tutorial! Thanks so much! That is wonderful! You did a great job. It is beautiful. I really like it. I am not very proficient with curved or circular piecing. I will have to try it one day. I do like the double boarder, what a great idea. I makes the quilt POP! lol at the action shot! Very pretty! I really love the two borders you added. The solid brown is a perfect complement. This quilt has a very "old" look to it . . . which is meant as a compliment! Looks as if it could be found in a quilt museum somewhere with a date of 1880 on it. Lovely. It does look vintage! Beautiful quilt and love the action shot…that sounds like something my sweetie would come up with! Yes, it did turn out fabulous! :) I haven't seen many quilts with the Hello Betty fabric. This one makes me like the line even more! It is beautiful! I especially love the borders. I've got to make a quilt with my Hello Betty stash. I just love that line. This is brilliant! I really love the colors in this one! They work really well with the pattern, too! ha ha! Action shots. Love it! I love it! I love both the fabric and the pattern. What a wonderful blog you have! So inspiring (O: Great tutorials too!!! absolutely gorgeous!!! I love the circles, the prints, the boarder…..it is perfect all the way around!! Pretty! The quilting adds so much! 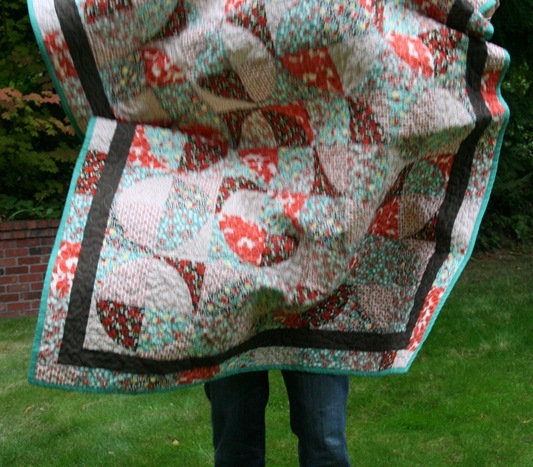 I am amazed that you are quilting when feeling so blah…good for you! Do you think I could use a few more !!!? This circles look great! Really a nice quilt! I tryed myself on a pillow with circles and would love to make a quilt one day, this one is inspiering…. PS I have your blog on an RSS feed as I love it and don't want to miss out of anything!! It looks amazing! I'm glad you decided to do this block for our bee, too, because I would have never attempted it otherwise! So jealous that you are all done with your quilt! I love it! Hello Betty in the orange and brown is one of my favorite! Love the curves and the border. Your quilt turned out beautiful! I love the quilt. Gorgeous. I love it! I'm kinda obsessed with "Hello Betty" and this quilt is perfect. my husband and me are cracking up at the "action" shot!! I love it! Nice action shot! Thanks for the pattern link. That last shot is hysterical! But isn't an action shot for a quilt someone actually using it for snuggles? This quilt its so ridiculously beautiful. Okay, I don't normally comment but I adore the action shot. It made me laugh and smile at how cute husbands can be, and I love that you included it. Since I don't normally comment, I thought I would say I love your sewing too. While I don't quilt, your blog has inspired me to put that on my list of planned projects (right now I am focused on Halloween costumes). You have beautiful work. Thanks for sharing. I absolutely LOVE this quilt and the fabrics you used!! I have been wanting to buy this fabric for a while but couldn't think of a good pattern. I may have to give this a try! Thanks! I love it. And i do have to admit that I laughed really hard at the action shot of the quilt. Way more exciting. BEAUTIFUL!! The aqua and red combination is really wonderful. Haha! That sounds like something my husband and brothers-in-law would say. Your quilt is beautiful! Beautiful! I love everything about it! The quilting looks great – I love how wrinkly it is! I must say, the "Action Shot" is the very best photo and photo comment I have seen in a long time. I LOVE it! Your man has a great sense of humor. Give him a hug from me. And it goes without saying that your quilt is beautiful. They all are. I love watching what you come up with each time you present your newest creation.